Since using remote patient monitoring technology, the hospital has had zero readmissions for patients with liver failure. The Einstein Medical Center wanted to decrease readmissions for liver failure patients by 50 percent. Caregivers had a longtime interest in the potential for remote patient monitoring and turned to telehealth technology to address this mandate. Thus far, since implementing the RPM processes, the hospital has gone more than two months without any readmissions. "The problems we encountered included issues that come up with all patients with a severe chronic illness," said Richard Kalman, MD, assistant professor of medicine SKMC in the department of digestive disease and transplantation in the division of hepatology at the Albert Einstein Healthcare Network in Philadelphia. Despite requiring all patients to attend follow-up appointments within two weeks, the readmission rate still was 40 percent. Patients often would come to the clinic and be readmitted directly because they were too sick, or would be called to come to the hospital for severe laboratory abnormalities, or would present to the emergency room feeling sick due to non-compliance. And some readmissions were unavoidable, of course. 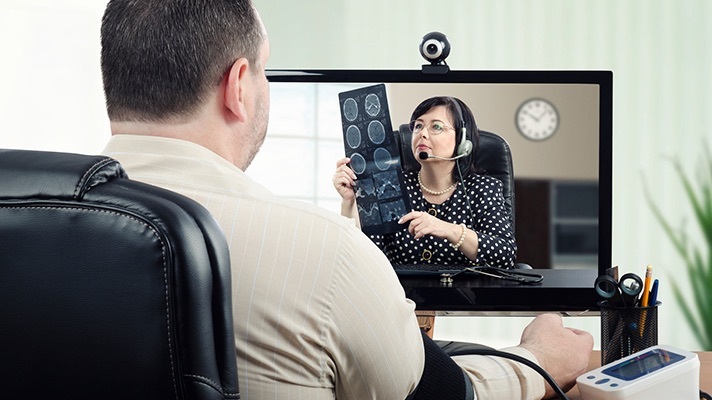 The hope with the initiation of the telehealth remote patient monitoring program was to find problems when they were still small and could be managed as an outpatient, thus avoiding a readmission. Einstein Medical Center uses remote patient monitoring technology from Vivify Health. Other vendors of remote patient monitoring technology include Biotronik, Boston Scientific, GE Healthcare, LifeData, Medtronic, Philips Healthcare and Spacelabs Healthcare. "The technology allows our patients to have a remote visit within 48 hours of discharge with one of their liver providers, and also allows the patient to relay information including symptom assessment and vital signs to the liver clinic as well as to our partnered visiting nurse program," Kalman explained. "The device is set up with the help of the visiting nurse, and the patient then uses the device to log symptoms and vitals." The program, which lasts for 30 days, is not currently integrated directly with the organization's EHR, but the online portal is user-friendly and allows for good communication, he said. Telemedicine technology allows the liver team to find small problems before they become major issues that might require hospital admission. The team is constantly adjusting blood pressure pills, diuretics and medications to control high ammonia levels that can lead to hepatic encephalopathy. "One example that comes to mind is of a rather cantankerous older gentleman who is on the list for liver transplant," Kalman recalled. "He would always claim that his blood pressure was elevated in the office because he disliked doctors so he never allowed me to prescribe a blood pressure pill. This technology allowed him to take his blood pressure at home, and I was able to demonstrate that his blood pressure was more than just white coat hypertension." His blood pressure is now under much better control, and although he has not yet reached the top of the transplant list, when he does, he will have a decreased risk of stroke and cardiac pathology because his blood pressure is under good control pre-operatively, Kalman added. The remote patient monitoring technology is not just having an impact on patients and readmissions, it is having an impact on value-based care. "The impact of this technology on value-based care is simple," Kalman said. "It allows the patient to provide more data to providers, thus allowing for more efficient and timely care that also allows for less frequent office visits and improved communication."